These discs normally serve as cushions between the bones. The discs can become damaged or dry with age. Injury can also cause a disc to bulge (or herniate ). These changes can create pressure on nerves leaving the spine. This can cause pain, numbness, and weakness. A cut will be made in the skin at the back of the neck. The muscles will be pushed aside. 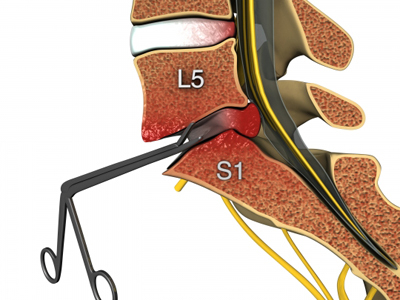 A small piece of bone will be removed to get to the disc space ( laminectomy ). Next, the doctor will gently push the nerve aside and remove the disc material. Lumbar disk herniation. EBSCO DynaMed Plus website. 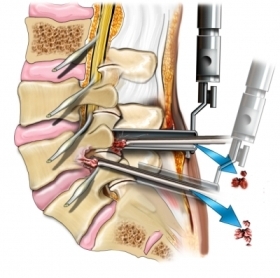 Available at: http://www.dynamed.com/topics/dmp~AN~T116077/Lumbar-disk-herniation . Updated September 6, 2017. 6/7/2007 DynaMed Plus Systematic Literature Surveillance http://www.dynamed.com/topics/dmp~AN~T116077/Lumbar-disk-herniation : Peul WC, van Houwelingen HC, et al. Surgery versus prolonged conservative treatment for sciatica. N Engl J Med. 2007;356:2245-2256.